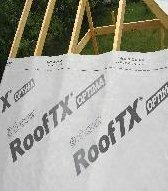 Daltex® RoofTX® Optima is a 3-layer low resistance vapour permeable air barrier roofing underlay for pitched roof construction. Daltex® RoofTX® Ultra is also certified for use in walling. Daltex® RoofTX® Optima is suitable for fully supported or unsupported applications and can be utilised in conventional ventilated roof constructions. Vapour breathable Daltex® RoofTX® Optima has the added advantage of being suitable for use in unventilated roofing applications, and is accredited via BBA Certificate 06/4334 and IAB Certificate 06/0237. accordance with the relevant Agrément Certificate. Standard weight - 360mm width (1.82kg/m2) Narrow Corodrain valley troughs for use with single lap tiles in limited applications. Both standard (type:HA) and heavy duty (type:AX). They incorporate sanded strips (min. width 35mm) for the mortar to bond to. Sold in packs of 10 ..
Standard Corodrain valley troughs for use with double lap slates and tiles, which are dry bedded. Both stardard (type:HB) and heavy duty (type:BX). Sold in packs of 10 ..
Standard Corodrain valley troughs for use with single lap tiles. Both standard(type;HD) and heavy duty (type:DX). They incoperate sanded strips (min. width 35mm) for the mortar to bond to. Sold in packs of 10 .. Provides a weatherproof protection between a sloping roof and a vertical abutment. The bonded sanded strip gives maximum mortar adhesion, and the two bars along the horizontal section prevent moisture entering the roofspace. Sold in packs of 10 ..